Struggling to get a good night’s sleep? Having the right pillow can mean the difference between a night spent tossing and turning and deep, dreamless sleep that leaves you feeling refreshed and ready to face the day. Memory foam pillows are often recommended by chiropractors and physiotherapists to help prevent or treat neck or shoulder pain caused by sleeping in an awkward position. In this article, our buying guide and reviews will talk about different types available and what to consider when searching for the best memory foam pillow for you. We’ve also scoured hundreds of memory foam pillow reviews from varying companies and brands to find the top 10 for every type of sleeper. 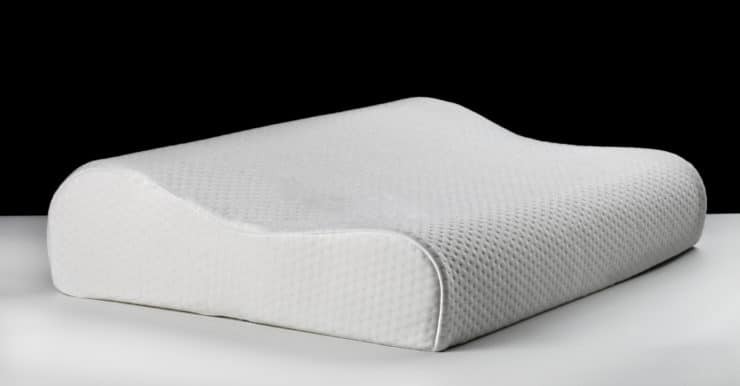 Whether you sleep on your front, back or side, the Simba memory foam pillow will support your head and neck to help you get a good night’s sleep. In fact, it’s so supportive, it sometimes feels as if your head is floating rather than resting on a pillow. Like many memory foam pillows, there’s a bit of a synthetic smell when you first take it out of the box. This is normal, and is a process called “off-gassing.” The smell disappears after a few days. Simba describes their pillow as ‘adapts to you’; the cushioned foam adapts to the unique curves and contours of your head and neck to support your body in a natural position that eliminates pain which is made of pressure points. The foam is quite firm and if you haven’t slept on a memory foam pillow before, you may find it takes a bit of getting used to. Stick with it for a week and you may just find it the best memory foam pillow you’ve ever had. If you hate sweaty hair and can never find a cool spot on your pillow, the new addition from Eve may be the ideal bedding for you. Eve believes that one size and style of this memory foam cooling pillow can suit every type of sleeper. The dual-foam design helps achieve a balance between support and softness, so it doesn’t feel as if your head is being propped up by a brick. Air holes in the foam help the pillow stay cool whichever surface you use. If you’re a warm sleeper or often have to turn your pillows during the night in hot weather, you’ll appreciate this ventilation. The Eve isn’t the cheapest memory foam pillow you’ll find, but it’s made of top qualtiy materials. In particular, the jersey knit cover is thick, super soft and can be machine washed without losing its stretch. Rather than using solid layers of memory foam, the TEMPUR comfort pillow is filled with thousands of TEMPUR micro-cushions which gives a plusher feel than other memory foam pillows. The visco-elastic material softens in response to your body temperature to support your head and neck whether you sleep on your back, front or side. This makes it a great choice if you tend to move about in sleep in different positions. TEMPUR pillows and mattresses have also been clinically proven to reduce tossing and turning giving you a more restful night’s sleep. The TEMPUR comfort pillow comes with a double-sided textured cover but also fits inside a regular pillowcase so won’t look out of place on your bed. You can machine wash the cover at 60°C to get rid of bacteria and germs. This pillow gives you the comfort of soft feather pillows with the support of foam. It springs back to its original shape, but you do need to fluff and plump it every day or two to prevent the TEMPUR particles sticking together. The people at Emma are confident you’ll love their pillow as they offer a whopping 100-night test period with free returns and a guaranteed refund. 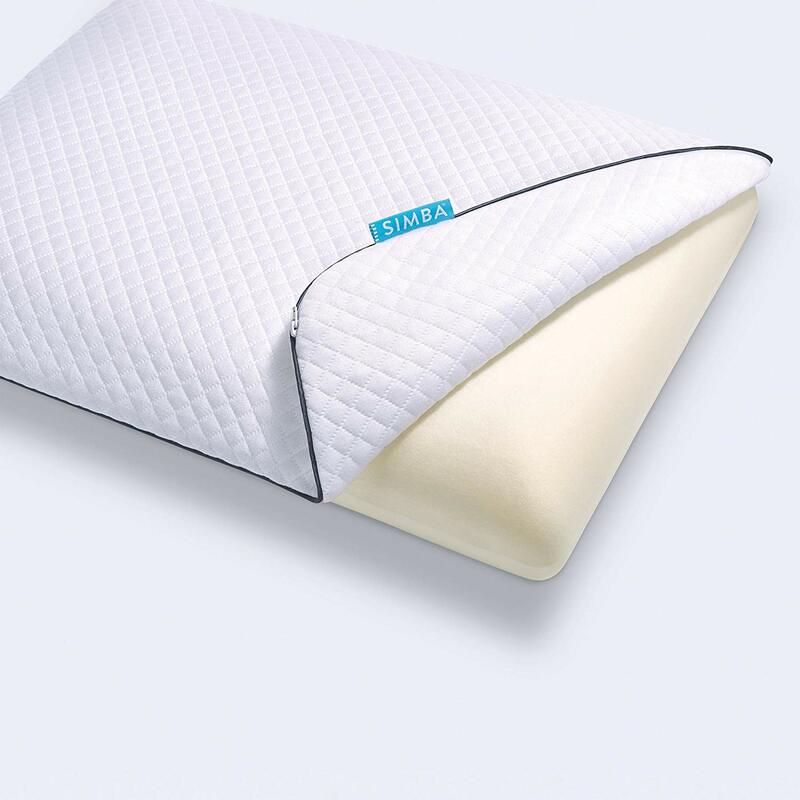 The modular design of the Emma Pillow consists of three separate layers: a soft airgocell foam, supportive cold foam and visco-elastic foam layer designed to distribute pressure. What this means in practice, is that you can experiment with the layers to get the optimum height and level of support you need. This is great for people who always sleep in one position, but if you tend to move around during the night, it may seem less comfortable. If you use all three layers together, then you have the choice of sleeping on the firm or the soft side, which allows your head to sink in a little more – perfect if you’re just getting used to the feeling of memory foam pillows. 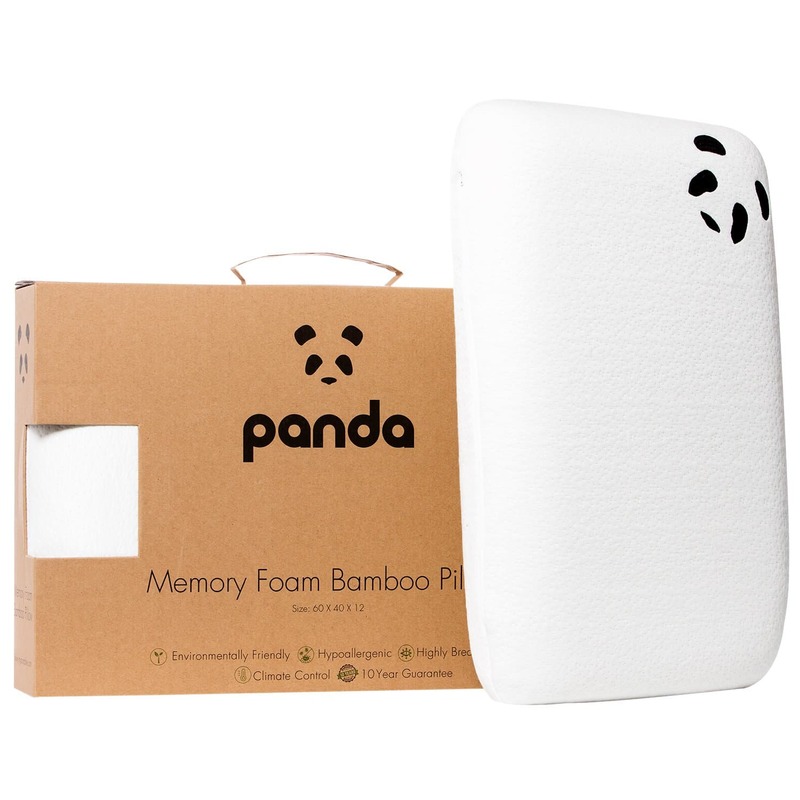 The Panda Bamboo on review here is great value for those who prefer a medium-firm pillow. The triple-layer design supposedly suits all sleeping positions, but in reality, this is a pretty flat pillow in comparison. If you sleep on your side, it may potentially not be high enough to keep your neck and spine in alignment. The three-layer design should prevent the Panda from getting dented over time. Unlike the Emma pillow, you can’t separate the layers as they’re nested inside each other. The pillowcase that comes with the Panda pillow is a bamboo/polyester blend. Bamboo makes for a lovely soft fabric that feels luxurious against your face. It’s also breathable, hypoallergenic and antibacterial, so won’t aggravate your sensitive skin. Panda recognises that pillows are a very personal thing and offer a 100% money-back guarantee if it doesn’t suit your needs, plus a ten-year manufacturer guarantee. One of the downsides of memory foam pillows is that they’re expensive. However, Supportiback offers a competitively-priced product with some unusual features. On one side of the pillow is a soft, breathable cover to keep you warm on cold nights. The other side has a heat-dissipating gel designed to keep you cool on hot nights. The high-density memory foam is firm and supportive. But, as you might expect with a budget pillow, there are a couple of niggles. It’s relatively common for memory foam pillows to have a bit of an odd smell for the first day or two. But the scent of the Supportiback pillow lingers, and you may potentially be airing it for a few extra days before you’re happy sleeping on it. But the big downside is its size. It’s much smaller than regular pillows and a standard case will swamp it. If you move around a lot when you sleep, you may even find yourself falling off it. If you don’t mind smaller pillows, the Supportiback is a good choice if you want to test out a memory foam pillow without spending too much. Martian Dreams take a different approach to the ‘one-pillow-suits-all’ problem. The pillow is filled with removable shredded foam meaning you can adjust the fill to create a pillow that’s the exact right height for you. If you’re a broad-shouldered side sleeper, you may still find that there’s not quite enough fill to create the height you want. If that’s the case, Martian Dreams’ customer service team may be able to send you some extra fill to plump up your pillow. The bamboo rayon cover is breathable and soft on your skin. Despite the micro-vented cover, this pillow can get a little hot in warm weather. Because of its construction, you might need to fluff your pillow regularly to loosen up the foam inside. It’s relatively inexpensive but as the foam has a tendency to compress over time, you may end up replacing it more often than other more expensive pillows. The TAMPOR neck pillow also uses shredded foam to provide a traditional shaped supportive, adjustable pillow. When you first open it, the pillow seems quite flat, but leave it to air for a couple of days, and it expands to its full size. This is a big pillow with a lot of fill, so it’s handy that you also get a storage bag for any foam you do remove. It’s also a lot softer than a most memory foam pillows. If you find firm models uncomfortable, you may prefer the feel of the TAMPOR neck pillow. On the downside, as the pillow is big, you may struggle to fit it into a standard pillowcase or find that if you do, this compresses the foam a bit too much. It does come with a protective cover which you can machine wash, but this isn’t quite the same as a soft cotton pillowcase which we think would have been much better. The TAMPOR pillow comes with a five-year guarantee which is great if you have any issues with it. Unlike a majority of the pillow reviews we conducted, the Contour memory foam pillow has an ergonomic shape that’s designed to support your head and neck. The foam is softer than most pillows meaning it compresses a fair bit. If you sleep on your back and want a low loft, this should be sufficient, but if you’re a side sleeper, you may find it doesn’t give you enough height and support. If you suffer from allergies, this is a good option as the bamboo fibre makes the pillow hypoallergenic and antibacterial. It won’t irritate your sensitive skin, and it’s a sustainable material. It’s worth noting that this particular product on review is a small pillow (30cm x 50cm). If you’re putting it in a standard-sized pillowcase, then you’ll have a lot of excess fabric. The design helps keep your head in place but if you’re a restless sleeper, you may find it’s too small for you. Another ergonomically-shaped product, the Snug pillow follows your shoulder’s natural curve and cradles your head. The wave shape means you can test out two different heights to see which suits your neck better. Although the two sides are different heights, it’s quite a low pillow, so you may want to add an extra pillow underneath if you sleep on your side. It gives a medium-firm level of support, but the pillow does sag a bit over time. You may expect this given the price of the pillow, but it’s something to bear in mind. Snug do provide a one-year manufacturer’s warranty, but unlike a lot of companies, they don’t have a trial period or satisfaction guarantee. This means if you don’t find it suits you, you may not be able to get your money back. As we spend up to a third of our lives tucked up in bed asleep, it’s surprising that we don’t pay more attention to the pillow we’re using. I’ve personally been guilty of using cheap microfibre and polyester pillows for years – and have paid the price! According to recent research by the British Chiropractic Association, more people in the UK are experiencing back and neck pain than they were five years ago. Using the right pillow can help reduce pain and stiffness and help you rest and recharge. Memory foam pillows aren’t for everyone, but if you suffer from back or neck pain or want to improve your sleeping posture, they are well worth checking out. Why Use A Memory Foam Pillow? Memory foam reacts to your body heat to soften and mould around the shape of your body. When the pressure of your weight is removed, it returns to its original form. Different densities of foam are used to create firm or soft pillows. It can help reduce the strain on your joints and boost blood circulation but its most important role it in keeping your spine aligned. Memory foam is also a good choice for allergy sufferers as it’s naturally hypoallergenic. While down and polyester pillows can harbour dust mites, fungus and bacteria, these little critters aren’t so keen on memory foam. 1) What Position Do You Sleep In? Finding the most comfortable pillow for you will depend on how you sleep. If you switch between sleeping positions, buy a pillow that will adjust to provide you with support throughout the night. To keep proper spine alignment, you want to support your head and neck four to six inches off the mattress. You may prefer a soft or medium-firm pillow if you sleep on your back. Side sleepers need a higher or firmer pillow to fill the gap between your shoulder, head and neck. The exact height will depend on how broad your shoulders are so an adjustable height pillow may be a good option. While most chiropractors recommend sleeping on your back or side, if you sleep on your front, it’s best to use a low pillow or none at all. You may also want to place a pillow under your stomach to help support your lower back. 2) What Type of Pillow Do You Prefer? All memory-foam pillows available on the market are designed to cradle your head and neck, but they go about it in different ways. 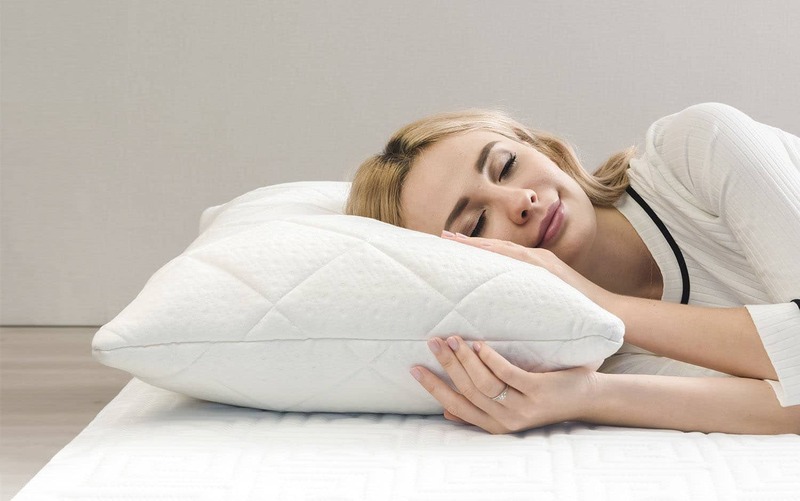 Contoured foam pillows have a unique wave shape that’s designed to cup your head and fill the space underneath your neck. They’re often smaller than a traditional standard pillow and can look a bit out of place on your bed, but the contours help support your neck if you sleep on your back or side. Layered foam pillows use multiple layers of memory foam with different thicknesses and densities to create a pillow that moulds itself to the shape of your head and neck. These pillows will generally specify whether they’re a medium-firm or firm memory foam pillow. Some are dual-sided, giving you the option to switch between a firm and softer feel. A few layered foam pillows, such as The Emma Pillow allow you to remove one or more of the layers to adjust the height (loft) to suit your sleeping style. A shredded memory foam pillow looks most like a regular pillow and won’t look out of place at the top of your bed. If you miss sinking into a down pillow, then you may prefer this style. The individual pieces of foam (or micro-cushions in the TEMPUR pillow) supports your head and neck, but often make for a soft memory foam pillow. Although they’re designed to spring back into shape come morning, you’ll need to fluff and plump your pillow every couple of days to help prevent the foam pieces sticking together. 3) Are You a Cold or Hot Sleeper? Memory foam retains heat, so some people find them too warm in the summer. On the other hand, if you’re a cold sleeper, you may love being cocooned in a cradle of warmth. If you are a warm sleeper, then look for a pillow with ventilated foam or a cool gel so you don’t wake up in a sweaty mess. Pillows are such a personal choice that it’s hard to recommend one that will suit everyone regardless of whether you’re a side sleeper, back sleeper or front sleeper. That’s why our favourite is the Simba memory foam pillow. 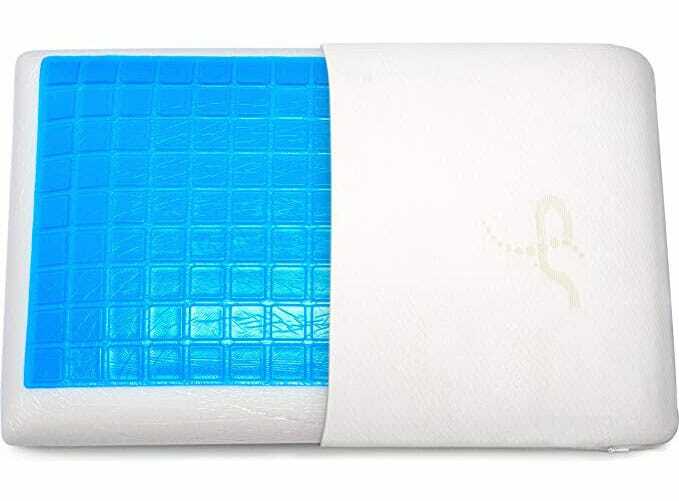 The most comfortable pillow of 2019, it provides an exceptional level of support whatever position you sleep in and is highly rated for comfort in memory foam pillow reviews. If you’re still clinging to your old down or polyester pillows, perhaps it’s time to give memory foam a go and see if it can give you a perfect night’s sleep.